Nuking Politics: Classic Nuke - It Really is Bush's Fault! Classic Nuke - It Really is Bush's Fault! So, the moment we all have been waiting for has come and gone. The Supreme Court has issued their ruling on ObamaCare™. And as we all knew, Justice Kennedy was the deciding factor, and ended up ruling that the mandate is unconstitutional, and along with the more conservative justices was on board with striking down the whole law. Except that Kennedy wasn't the deciding factor. Instead, Chief Justice John Roberts pulled the old switcheroo on like, everyone, and went with the left side of the court in true Judas Iscariot fashion. And since he was Bush's guy, well, we can officially blame Bush. Obama has been warning us all for years now that everything is Bush's fault, but we just didn't listen. We thought he was just making excuses for being such a miserable failure. But maybe he was just trying to tell us that having him for a president and the terrible things that would come from it, were Bush's fault. He could be right, judging from the only really important ruling so far by Bush's "guy" on the court. Or maybe not. Something about all of this stinks. And I don't mean the fact that the Supreme Court didn't slam the gavel down on ObamaCare™ and effectively cancelled a lot of parties tonight throughout the country. I mean, the fact that Roberts went with upholding the law. It makes no sense. He isn't a leftist, but far from it. What is going on here? Initially, I was a bit upset and disappointed at the ruling, but more and more I've just started to question it and look into what the actual ruling was. If you got the quick headline cliff-notes version of it, then you may not know this, but even the liberal side of the court agreed, apparently with Roberts, that the Commerce Clause is not a constitutional basis for the mandate...which was what the Obama team was arguing for. - Nullify the 2nd Amendment. They can't ban the right to bear arms, but they can tax anyone who does have a weapon, even to the extent that nobody could afford to do so. - Nullify the right to free speech, as guaranteed in the 1st Amendment by levying taxes on anyone who speaks out against the government. - Nullify the right to vote, by instituting a tax on federal elections which a voter must pay if they intend to vote. The possibilities are endless. The federal government, based on this new precedent, could put such a large tax on anything they want, they could both control the population, as well as keep themselves in power indefinitely, if they so wanted. Of course, the argument here is that in our political system, such a thing could never happen. I am unsure, personally. 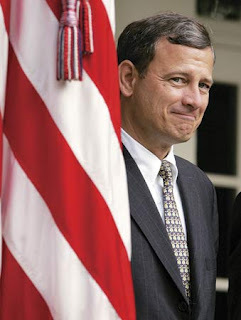 Some are even calling what Roberts did "genius", saying that making the ObamaCare™ law a taxation issue will allow it to be overturned by the people, who generally hate taxes, puts the lie to Obama's claim that the mandate isn't a tax, and reigns in the Commerce Clause for the first time in many years. I haven't quite made up my mind about this one yet, but I'd love to hear your thoughts on it. Please feel free to post below. What do you think about this ruling, and why do you think Roberts, of all people, was the one to side with the health law?